“Move ahead with confidence; you are rising. The First House in astrology begins with the Ascendant, the astrological constellation rising over the eastern horizon at the time the chart is cast. In the natal chart, the Ascendant represents the moment you were born. Like the sun and moon, the First House is one of the most important parts of a horoscope. The First House represents your physical appearance, how your body words, and where your strengths and weaknesses lie. It is the beginning to everything. The First House is also the ‘mask’ that everyone else first sees. Although the First House is the ‘house of self,’ it is also the persona you project. It is how you relate to the world first. If the First House card presents itself in a reading, it means you will soon be feeling your own strength. Although it may feel natural just to ‘take over’ and assert your power, you may need to pull back some. Try not to control or dominate certain situations as this could backfire. More positively, people may feel comfortable now with you as their leader and they won’t mind following your lead. It is important that you don’t abandon your goals now out of boredom. Presently, you will start things with great gusto. But you must follow up; you need to finish all that you start. The First House shows your image; so, how you come across to others is of utmost importance now and bears greatly on your success. Perhaps you may opt for a new look and indeed, this can have a bearing on how successful you will be. Since this house opposes the Seventh House of partnerships, it is a good omen regarding relationships of all kinds. It can mean relationships are about to mature or become more serious. Marriage may be on the cards, or it may mean you are transitioning into a better place concerning other people in general. As the First House is also about your physical body, it is important you pay attention to your health and the signals your body is sending you. Your body is your ultimate container, the first place your soul passes into. The First House card also speaks of beginnings and starting anew. It implies it is time to honor your gift of being distinct. It also suggests a position of leadership. 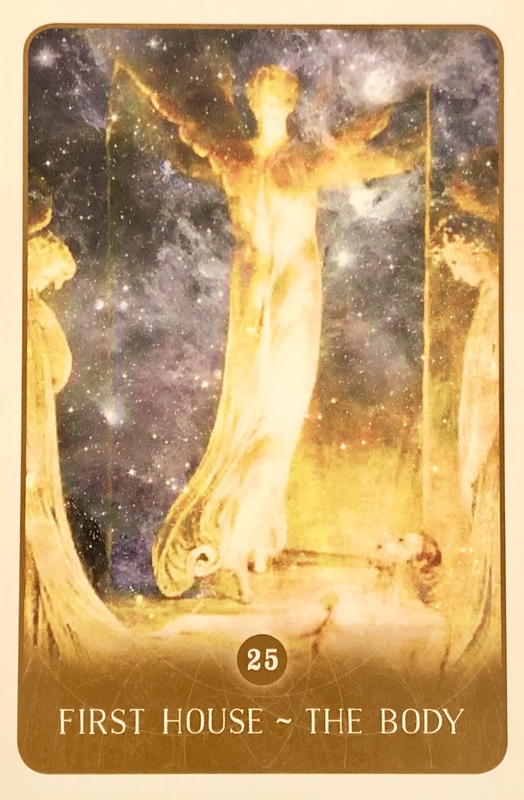 When this card turn up in a reading, it may be time to defend something of value to you, perhaps your reputation, your authentic self or your chosen life path. You may be challenged where you must stand by your convictions. You could have conflicts with certain authority figures and thus, need to go to some extra measures to keep a cool head in any given situation. This card marks a period of being tested or challenged, and indicates who you are and who you will become. Whenever is implied in the surrounding cards will indicate what must soon be faced and met. A focus on the physical body now. We have taken on so many upgrades and new energies from the Universe and we need time to properly assimilate them. The physical body has so many demands placed upon it in our everyday lives; it is often taken for granted just how much it does for us. There are some changes that need to be made in order for your physical body to heal and rejuvenate. Part of this is physical; nutrition, hydration and movement; and part of it is how you treat your body with the love and respect it deserves. We live in a society that has not been accepting of the physical differences in each of us, celebrating our unique attributes. Instead we have been shamed for not being cookie cutter perfect. Too fat, too thin, too muscular or not muscular enough; too tall, too short; too dark, too light; the list goes on and on. We berate ourselves for not fitting into the one percent of the world who we have put above the rest. And photoshopped of course, so many of them don’t even exist! It is starting to shift, very very slowly. We are finally seeing models who are plus sized, have varied skin pigmentation or are gender fluid. It is slowly happening. But do we accept ourselves? Do we love the physical vehicle we chose to experience this incarnation in? Or do we spend a lot of time wishing or forcing it to be something other than what it is? For most of my own life I have struggled. Growing up in the 80’s during the bloom of the supermodel, Cindy Crawford and Claudia Shiffer gracing the cover of every magazine, my friends and I in middle school and high school would spend hours wishing we looked like them. Now I see it in my own middle school aged daughter, even though I have been so careful to have positive input on body image with her. Twelve and thirteen year old girls wishing their legs were longer, their thighs were thinner and their tummies were flatter. Eating disorders rearing their ugly heads in children that are absolutely perfect just the way they are. Because we allow the media to tell us how we ‘should’ look. We believe that the models are better somehow than we are and that unless we are lucky enough to be born tall and willowy we are less valuable than those who are. The most important message is to stop and accept yourself now. Then take action steps towards wellness; a holistic approach. No more trying to be something we are not, but celebrating exactly who we are, that is where the power is. Not putting anyone above or below us, but treating all as equals. Loving the parts of ourselves we have long ago deemed unlovable and helping our loved ones do the same by loving them as they are. Imagine the freedom we will have when we stop struggling and find true harmony. Body, mind and spirit as One. Well said and thought out, I have often thought of these same things. You’re right. Thanks for posting this Dee. Good article and topic.